While London's youth decided to go aggressive-window-shopping me and Dan decided to go fishing. We headed to the Wandte about 2.30pm and fished in the bright sunshine. 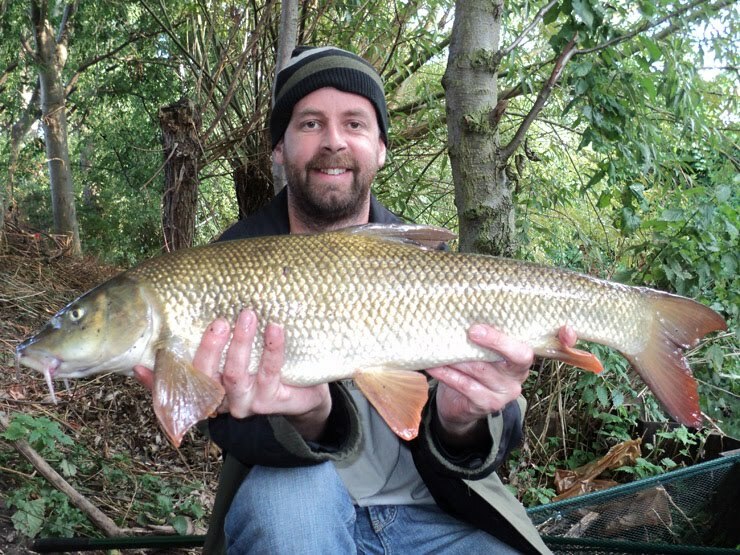 I had a bite first cast and connected to a barbel about four pounds but after a brief fight the hook pulled - at least we knew they were feeding! We then worked our way downstream, it was slow going as I have a twisted ankle. And no bites despited some very fishy-looking swims. Just after 5pm I cast out into a nice looking swim and had a bite instantly, a great fight and a cracking 7lb 0oz barbel (above) to luncheon meat. It was nice to get a photo in daylight - I think the smile says it all! With the water thrashed to a foam due to the battle I moved downstream and continued fishing, I had to be at a birthday party at 6.30pm so just before seven I crept back to the swim (I was going to be late) and had another bite, an even better fight and a 7lb 4oz barbel (below) I thought it was the same fish again as Dan slipped it into the net but it was slightly heavier, and comparing the photos it's a different seven pounder - two sevens in a day - sweet! And with that I hobbled off to get the train. And Dan's trip, same bait, same swims, no bites, I'm sure he's saving up his luck for the double! Put a smile on your face I see, wd. Details? Nice Barbel, Pike man!! Wow, it’s just amazing to think that you caught those from the Wandle, they really are great looking fish... well done mate!! In your reply to my last comment you mentioned that you wanted to catch a Tench. Was that a Tench from the Wandle? ...or just Tench from anywhere? Let me know, I might be able to point you in the right direction. PS Hope the Ankle is feeling better!! It was a top result, cheers guys! 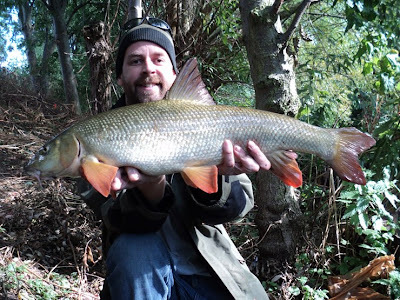 Ade, I'd love a Wandle tench (and I'm after a pound plus Wandle roach) but don't mention swims on here, the Wandle blog police won't like it. If you know where I can find them I'm at brian(at)prawnsoda.co.uk and thanks for any help. Cheers Paddy, ankle is frustrating it makes everything so slow as there is a lot of walking involved and I'm not prone to sitting still and letting it mend - enjoying having the kit stripped to a minimum though, it's amazing how much crap I normally carry that I don't need! Oh yeah, I'm after my esox fix as well - waiting for my Penton Hook ticket to arrive!